The PM8080-R Alternating Pressure Mattress System uses advanced pressure sensor technology that reacts to a patients movement. This hospital grade alternating pressure mattress is designed for patients who are spending more time in bed. The whisper quite air pump automatically readjusts air flow for optimal performance and patient comfort. 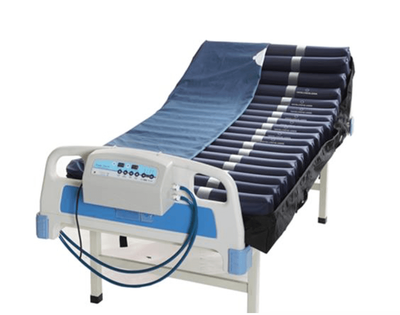 This Alternating Pressure Mattress comes with a hand held remote control that allows the patient to easily control the features on the pump without having to ask a caretaker for assistance. 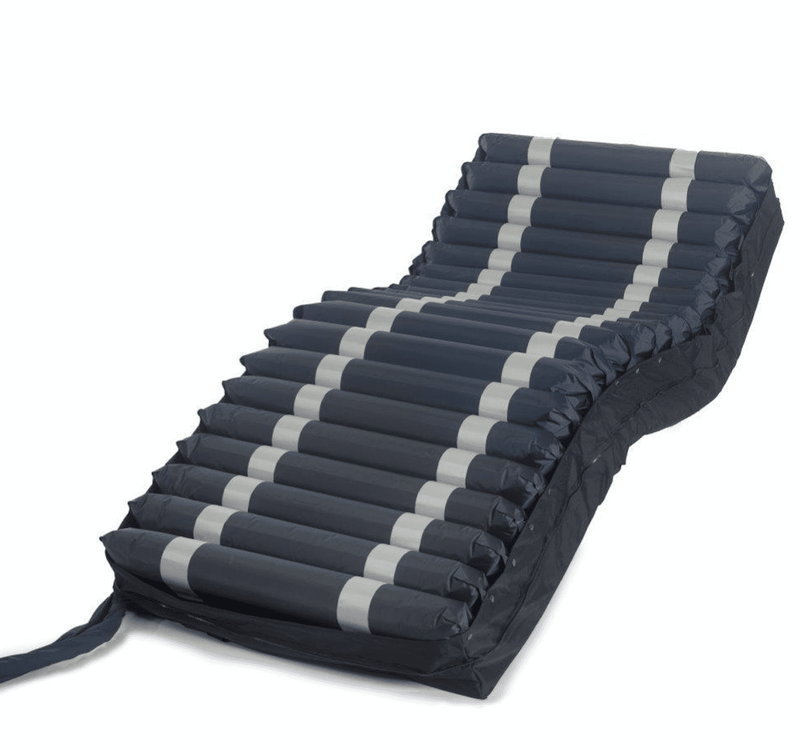 The PM8080-R is a dual therapy medical air mattress. The alternating pressure reduces painful pressure points as the low air loss provides constant air circulation preventing heat, sweat, and moisture build up on the skin. The PM8080-R adjustable alternating pressure mattress has 4 cycle times. (10,15,20,25 minute cycles) Most alternating pressure mattress systems are only set at one predetermined cycle. Patients in pain do not want to be moved much, adjustable cycles provide more options to control painful pressure points while still allowing blood flow to reach the skin to heal bed sores. The pumps digital micro-processor monitors the patients weight allowing you to adjust the alternating cycle time for pain management or advanced healing. The push button static float feature suspends the alternating pressure allowing the patient to safely transfer in and out of bed. Auto Firm feature rapidly hyper-inflates the air cells or baffles so they perform like rollers. This creates a stable support surface making it easier to turn and position patients. The static float can decrease the nursing time required for turning and repositioning patients. This can reduce risk of injury to caregivers' backs, shoulders and wrists. The dual layered air cell and seat inflation feature prevents the mattress from sinking in the center like many standard alternating pressure mattresses. The PM8080-R prevents the mattress from bottoming out in the event of a power failure. Bottoming out can often lead to an increase in pressure and can stop blood flow to the skin. Dual cells adds extra protection adding a protective air barrier between the patient and the bed frame. Includes Hand Held Remote Control! Get a high quality hospital air mattress that will fit all of your needs! The Pm8080-R Brings hospital grade quality into home health care, assisted living facilities or nursing homes. Patients and family members often select this mattress system when they cannot decide on a specific brand or model. *Includes air mattress, pump, and cover. Designed for a twin size box spring or standard medical bed frame. Elite comfort, Multiple Pressure Relief Options, Heals and Prevents Stages 1-4 Bedsores. Ideal For Long Term Care. Fluid Proof, Low Shear 4 way Zipper Cover, prevents shearing and friction. 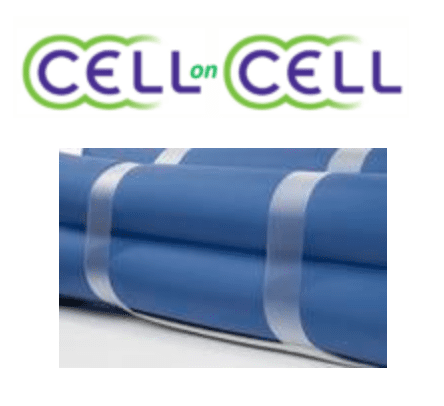 Unique cell-on-cell design ensures that the mattress will hold air in the lower cells in the event of a power failure. Transport connector locks in air for easy patient transport. Quilted top cover provides comfortable sleeping surface. Bottom cover has 3 non-skid rubber panels to prevent mattress from slipping. Dual therapies low air loss and alternating pressure. Static mode provides firm support for egress or ingress from mattress or side edge seating. Audible and visual alarms in case of low pressure. Auto firm mode for quick installation.